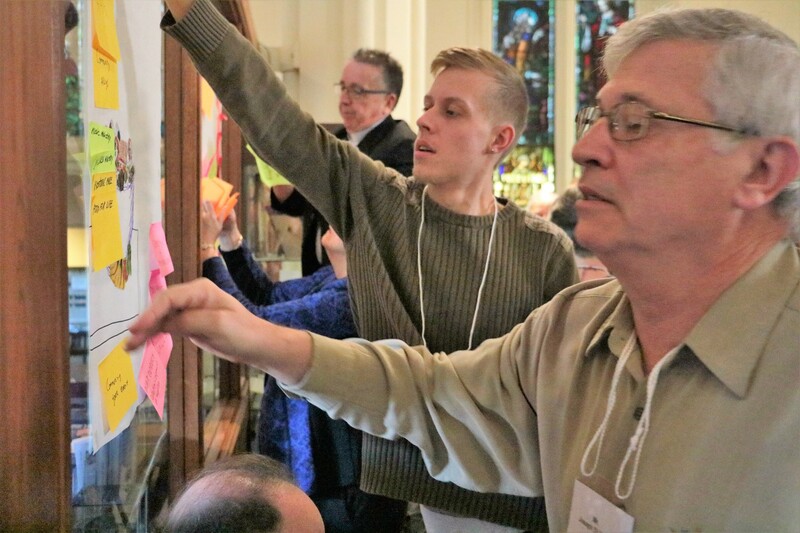 The work of Synod gets played out in many groups, committees and other components comprising the church in Niagara Diocese. Annually each one reports to Synod. Although their stories often reflect this year’s theme—Abundance: Baskets Overflowing—rarely do they get exposure beyond the pages of the convening circular. The Niagara Anglican scoured the reports to give you a sample of what they are doing for the church and its mission. The Incorporated Synod of the Diocese of Niagara is the legal entity (established by a statute of the Legislature in the Province of Ontario) with responsibility for the dealings of the Anglican Church within its diocesan boundaries. At Synod we seek God’s intention for us as we pray, discern, talk, listen and work at being a Church as a diverse community under the leadership of our Bishop, the Right Reverend Michael A. Bird. The Reverend Canon Marni Nancekivell, Secretary of Synod. All church buildings and land are either the property of the diocese or are held in trust on behalf of the diocese. The Bishop’s Advisory Committee on Church Buildings (BACCB), among other responsibilities, provides experienced, informed and impartial advice to parishes that have concerns about the condition, maintenance or preservation of their buildings. According to Canon 4.6, every project with a value of $15,000 or more falls within its purview, but there have been examples of parishes either circumventing its requirements or of simply ignoring them. The committee worries potential savings may have been missed and transparency may have been made opaque. Nevertheless, the committee was consulted by many parishes regarding major projects —including making facilities energy efficient or more accessible, developing safe churches and meeting fire safety needs—which all improve the social environment of our property and buildings. Ian Chadwick is BACCB Chair. The Bishop’s Decennial Inspection Committee (BDIC) is expected to have completed nine inspections by the end of 2016, with another eleven coming due in 2017. BDIC encourages parishes to schedule their decennial inspections when they come due, and assists (when requested) in developing action plans for completion of critical items identified on the inspection reports. They also conduct structural reviews of vacant diocesan buildings and provide advice on other unique building issues. Terry Charters is BDIC Chair. The Diocesan Safe Church Team has provided education, consultation, support and, when necessary, an investigative team in a variety of settings. In the past year, six “situational consultations” have demanded varying levels of involvement and response by the Team. The Diocese is intentionally broadening our volunteer base in this area, bringing together individuals of different ages, sexual orientations and backgrounds as we work together at discerning what it is to be a safer church. Whether we are clergy or church school teachers, deacons or working with newcomers, may we practise being a safer church, grounded in self-awareness, strong support systems and wise choices, for ourselves and for others. The Reverend Canon Marni Nancekivell is Director of Safe Church, Volunteer Management and Screening. The Insurance / Risk Management Subcommittee continues its work to ensure coverage meets our Diocesan and parish needs and is cost effective. Our insurance Broker is Jones Brown Inc. (formerly Pearson Dunn). The insurance carrier for the Diocese continues to be the ECCLESIASTICAL INSURANCE OFFICE PLC. The Subcommittee believes they both have a proven track record in insuring the needs of faith based communities. The Diocese did not qualify for the Profit Sharing (return of premiums) for the year ending Jan 31, 2016. We are hoping losses will be less in the coming year allowing the Diocese to be eligible for this discount. This discount is passed on to parishes on a prorated basis if their insurance is paid in full in the year. Premium rates per $100 of insured values have remained the same in the new policy year. However, properties that have not been appraised in the past three years will have a 3% inflation factor added to their values for the 2017/2018 premium year. Deductibles remain the same but coverage values for crime related claims have increased from $25,000 to $50,000. Joanna (Jody) Beck is Treasurer and Director of Finance. The Anglican Church Ministries Foundation (ACMF), an incorporated entity, receives and maintains funds, and then applies all or part of the principal and income for charitable purposes. In particular ACMF assists the Niagara Diocese to preach, promote and advance the spiritual teaching of the Christian family, and to support and maintain churches and the mission of the Church in order to propagate and express the Christian faith. The Foundation held investments of $17,916,863 (December 31, 2015) of endowed, rectory and parish funds. James Sweetlove is ACMF President. More and more people are doing family histories today and using church archives, so the Archivist is asking each parish to appoint their own Archivist. Records are taken to Mills Memorial Library at McMaster University to be digitized which is also sent to the parishes for their researching at no charge. Archdeacon John Rathbone is Diocesan Archivist. Since 1955 the Niagara Anglican has been at the forefront of our communications media. In it we have shared each other’s stories, reflected on differing ideas, attitudes or issues and through it all remained committed to the Gospel of our Lord Jesus Christ. The paper is strong because of the ownership felt by our contributors, who supply the paper with news and articles about their parishes, groups, diocese or special interests. Our advertising is stronger than ever, and the annual appeal which we partner with the national paper, Anglican Journal, continues to increase, thanks to the commitment and generosity of our dedicated readers. Being online ensures the option for those who wish to read the paper digitally, while retaining our print presence for those who want the hard copy. The future of all print media relies mainly on the quality of the products produced and the needs being fulfilled. It is a two way avenue. The Niagara Anglican and its “owners” have made it a busy thoroughfare, and hopefully this will continue in the years ahead. Partners in Mission (PIM) Committee will be organizing a Celebrating Mission Day in early 2017 where parishes can “show and tell” about the ways they are involved in mission partnerships, so we can learn from and encourage each other. The rebuilt Church in Bermejas Cuba was re-consecrated. PIM also produced videos about Cuba for the World Day of Prayer, as well as of the Justice Camp. Several visits from the Bishop of Cuba and others highlighted this past year. The Reverend Canon Stuart Pike is PIM Chair.